Congress leader Mallikarjun Kharge today moved the Supreme Court praying for quashing of the October 23 order of the Central Vigilance Commission and that of the Centre’s Department of Personnel and Training divesting CBI Director Alok Kumar Verma on the ground that the same were passed in derogation of powers conferred upon the Statutory Committee under the Delhi Special Police Establishment (DSPE) Act. Kharge, who is also on the three-member statutory committee, said the October 23 orders were passed in violation of powers conferred upon the Statutory Committee under Section 4A and 4B of the DSPE Act which provides that the Director of CBI shall be appointed on the recommendations of the statutory committee and transferred also only with its consent. The Congress leader sought to be impleaded as an intervenor in the plea moved by Verma challenging his removal. 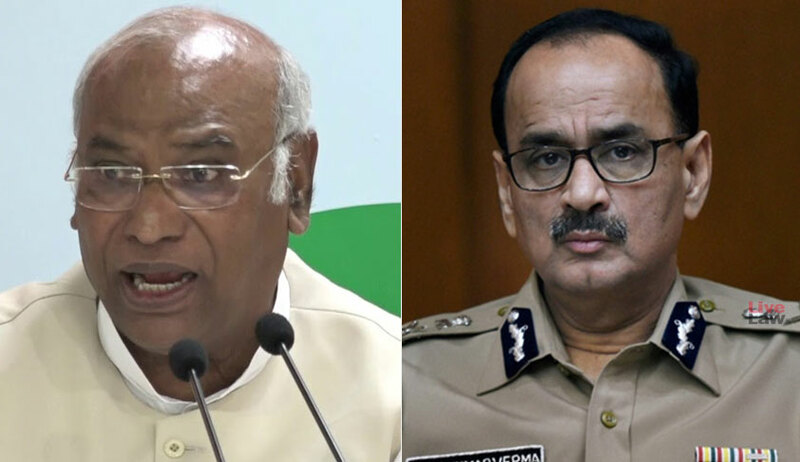 Kharge referred to apex court’s observation in Vineet Narain’s case wherein it was held that Recommendations for appointment of the Director, CBI shall be made by a Committee headed by the Central Vigilance Commissioner with the Home Secretary and Secretary (Personnel) as members. He also referred to section 4 of DSPE Act and said, “On a conjoint reading of Section 4A, Section 4B of the DSPE Act and the directions of this Hon’ble Court in Vineet Narain’s case, it is clear that the tenure and term of the Director, CBI is protected and even the process of transfer cannot be effected without the previous consent of the Committee”. “In this background, the orders dated 23.10.2018 passed by the CVC and the DoPT divesting Shri. Alok Kumar Verma of his powers, functions, and duties is a direct and concerted attempt to impede the independent functioning of the Director, CBI,” he contended. “The Applicant being a member of the Statutory Committee was not consulted nor was he a part of any meeting or privy to any decision to divest Shri. Alok Kumar Verma of his powers as Director, CBI. It is also not in public domain that any such meeting of the Statutory Committee was convened. It is therefore clear that the decision to divest Shri. Alok Kumar Verma, IPS of his powers as Director, CBI was taken by the political executive in complete contravention of the provisions of the DSPE Act, CVC Act and the directions of this Hon’ble Court in Vineet Narain’s case and as such ought to be set aside to maintain the institutional sanctity and integrity of the CBI,” said he. Kharge further said that “Section 4 (1) of the DSPE Act relates only to the investigation of offences and cannot in any manner vest CVC with the power to divest the Director, CBI of his powers and functions. Further, there is no power conferred upon the CVC under Section 8 (1) (a) or 8 (1) (b) of the Central Vigilance Commission Act, 2003 to pass any order of the kind issued on 23.10.2018. “It is further submitted that the Central Government also cannot exercise any power under Section 4 (2) of the DSPE Act which is in derogation of the powers of the Statutory Committee…the political executive vide the order dated 23.10.2018 has completely negated the role of the Statutory Committee constituted under section 4A of the DSPE Act which is entrusted with protecting the integrity of term and tenure of the Director, CBI”. On October 23, while the CBI Director Alok Kumar Verma was divested of his powers by orders of the CVC as well as the Central government, CBI Special Director Rakesh Asthana was sent on a leave and the interim charge of the Director’s office being assigned to M Nageshwar Rao. On October 24, Verma had challenged Centre’s decision to remove him as the Director of CBI while stating that investigating officers of sensitive cases were being changed. Asthana had also moved Delhi High Court challenging the FIR registered against him in the bribery case. Subsequently, on October 26, the apex court issued a string of interim measures wherein it directed that the the inquiry in respect of the allegations made in the note of the cabinet secretary as Verma shall be completed by the CVC within two weeks. The court had also directed Hyderabad police to provide adequate security to Satish Sana, the original complainant in the alleged bribery case against Asthana. Many in the opposition have been accusing the government of removing Verma only to stop him from probing Rafale scam. After Verma’s removal, Yashwant Sinha, Arun Shourie and Prashant Bhushan also moved court seeking registration of FIR in the Rafale scam. Earlier, they had met Verma with their complaint in connection with the Rafale scam wherein they had sought registration of FIR in the matter.